Manisah Bista, Kristina Roberts, Debra Lopez and Agus Ngabidin were recognised by receiving the top awards. 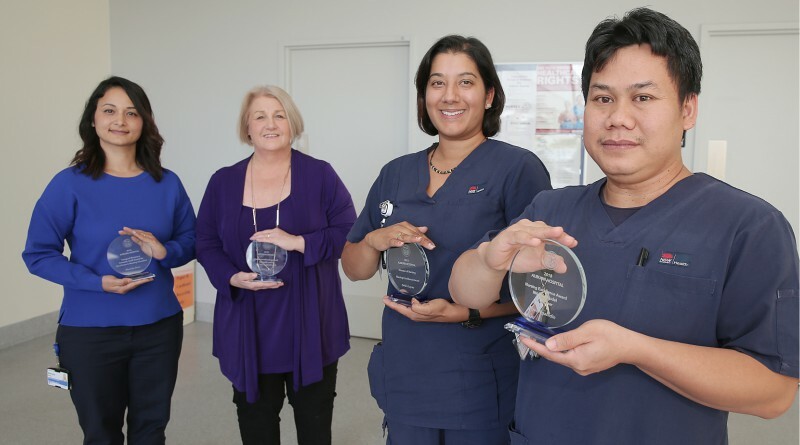 As part of the WSLHD International Nurses and Midwives celebrations Auburn Hospital held their annual Nursing and Midwifery Excellence Awards. Nurses and midwives were recognised for their tremendous commitment to excellence and dedication to the service. Auburn Hospital director of nursing and midwifery Kate Murphy said the nurses and midwives were nominated for these awards by their peers and other hospital staff. “I’d like to congratulate all our nurses and midwives who on a daily basis go above and beyond their roles providing quality healthcare to our patients,” Ms Murphy said. “It’s always a difficult decision to select the finalist of the Auburn Hospital director of nursing award. “This year was no different, however clinical nurse Debra Lopez was my preferred choice for going above and beyond to consistently achieve outstanding excellence. Ms Lopez said she has been at Auburn Hospital for 15 years and considers it her second home. “It was a privilege to receive this award … it came as such a surprise,” Ms Lopez said. “I accept this award not just for myself but for all nurses who are hardworking and strive for excellence in care. WSLHD acting workforce manager Yervette Jones, Auburn Hospital clinical nurse Debra Lopez and director of nursing and midwifery Kate Murphy. Westmead Hospital’s 40th birthday is approaching and we need your help! 10 Nov, 2017, 10:12 am Jenny Harrison Comments Off on Westmead Hospital’s 40th birthday is approaching and we need your help! Ever seen salsa dancing in a hospital? 22 May, 2018, 3:25 pm Sia Anthopoulos Comments Off on Ever seen salsa dancing in a hospital?